Dehydrating tomatoes is a very simple process when you have a dehydrator. I have found dehydrating works so much better than the sun drying method. I tried this one time with screens and after a day or so the drying process started to attract flies! That did it for me, I got a dehydrator and have enjoyed drying my own tomatoes ever since that day. There are a few reasons for dehydrating tomatoes. If you are totally serious about adding in more raw foods, realize that the sun-dried tomatoes that you buy may actually be oven cooked tomatoes. You do not know at what temperature those tomatoes have been processed. Another drawback to buying sun-dried tomatoes is that they can be a little pricey. With all of the benefits of eating tomatoes, fresh and dehydrated, you are getting the live enzymes when you dehydrate them. If there ever was a single reason to invest in a food dehydrator, it would be for making sun dried tomatoes. The finished product often tastes better too since you get to control how much oil and spices are used. 1. Invest in the best food dehydrator. I recommend the Excalibur dehydrator. 2. Use only organic tomatoes. Buy local or better yet, grow your own tomatoes. The best type of tomatoes to use is the Roma variety which is very fleshy, low in seeds and juice. However, just about any type of tomato can be used. 3. Don't skin the tomatoes. The tomato peel is where many of the tomato nutrients are concentrated. 4. Slice the tomatoes about a ¼ inch thick lengthwise and arrange them on a single layer of mesh dehydrator sheets. 5. Sprinkle with natural salt and any other herbs that you would like. 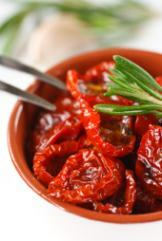 The most popular types of herbs to use on sun-dried tomatoes are basil, thyme and oregano. 6. The dried tomatoes should be flexible, but not brittle. They should feel slightly tacky, but with no visible water on them. 7. Allow the tomatoes to cool and then package them in airtight plastic bags. If you have a vacuum sealer, then vacuum seal them. Dried tomatoes absorb moisture from the air very easily. To keep them from spoiling, store them in your refrigerator or for long-term storage, put them in you freezer. 8. If you want to pack your dried tomatoes in oil, do so for only a few days to a week before using them. It is best to store the oil-packed tomatoes in the refrigerator. Dehydrating tomatoes is a fairly easy process to do it yourself and a fun project to do with your spouse, kiddos or with a friend. Once you make your own you will be doing more with all those tomatoes you have been producing all summer to enjoy all of the sweet goodness in the winter.